BACKGROUND AND PURPOSE: Pure sensory stroke (PSS) usually is caused by a lacunar infarct; reports of PSS caused by cerebral hemorrhage have been rare. We correlated clinical and neuroradiologic findings in patients with PSS caused by cerebral hemorrhage. METHODS: We retrospectively studied seven patients with appropriate clinical findings and lesions revealed by X-ray CT and MR imaging (five men, two women; age range, 46−64 years; mean age, 55.9 years). RESULTS: Hemorrhages involved the thalamus, pons, internal capsule, or cerebral cortex. MR imaging revealed thalamic PSS was located in the ventral posterior lateral (VPL) or ventral posterior medial (VPM) nucleus; a lesion producing a thalamic cheiro-oral syndrome was situated on the border between the VPL and VPM. Pontine PSS involved the medial lemniscus together with the ventral trigeminothalamic tract, sparing the anterior and lateral spinothalamic tracts. Accordingly, pontine PSS, but not thalamic PSS, selectively affected vibration and position sense while leaving pinprick and temperature perception intact, and oral sensory involvement was bilateral when cheiro-oral syndrome had a pontine origin. MR imaging revealed hemorrhage in the postcentral gyrus in the cortical variety of PSS and in the posterior part of the posterior limb (thalamocortical sensory pathway) in PSS of internal capsular origin. The postcentral gyral lesion impaired stereognosis and graphesthesia. CONCLUSION: Focal hemorrhages can lead to purely sensory stroke syndromes, and the clinical deficits are fairly well linked with the locations of the bleeds. Pure sensory stroke (PSS) is a well-defined clinical entity showing prominent hemisensory manifestations without other major neurologic signs (1). Fisher (1) attributed this syndrome to a lacunar infarct in the ventroposterior nucleus of the thalamus. Although thalamic stroke is the most frequent cause of PSS, cases of non-thalamic stroke involving the brain stem (2−5), internal capsule (6, 7), or cerebral cortex (8) also have been reported to produce PSS (9). PSS usually is caused by a lacunar infarct, and PSS caused by cerebral hemorrhage rarely has been reported. We retrospectively evaluated clinical and neuroradiologic findings in patients with PSS caused by cerebral hemorrhage. Thirty-two patients with PSS syndromes with appropriate stroke lesions shown by CT/MR imaging at Toride Kyodo General Hospital between 1991 and 1999 were identified retrospectively. Seven of 32 lesions were caused by hemorrhages, and the others were caused by infarctions. The seven patients included five men and two women (age range, 46−64 years; mean age, 55.9 years) who had focal hemorrhages shown by CT/MR imaging without any other brain lesions. MR imaging was performed with a 0.5-T superconducting magnet, using the spin-echo technique. T1-weighted (380/15/2 [TR/TE/excitations]) and T2-weighted (2000/100/1) images were obtained in the axial and coronal planes. Patient 1 was a 47-year-old man with a history of hypertension and hyperlipidemia, who suddenly developed numbness over the left half of the body, including the face. A neurologic examination showed normal motor function with symmetrically decreased deep tendon reflexes. Babinski's sign was absent, as were cranial nerve palsies. Pinprick, temperature, vibration, and position sensations were slightly reduced in the left limbs and left side of the trunk, and moderate dysesthesia was present over the left cheek, left side of the trunk, and left knee (Fig 1). T1-weighted MR imaging performed 12 days after onset of symptoms revealed a lesion in the ventral posterior medial (VPM) nucleus of the right thalamus (Fig 2). Cerebral angiography showed no abnormalities. 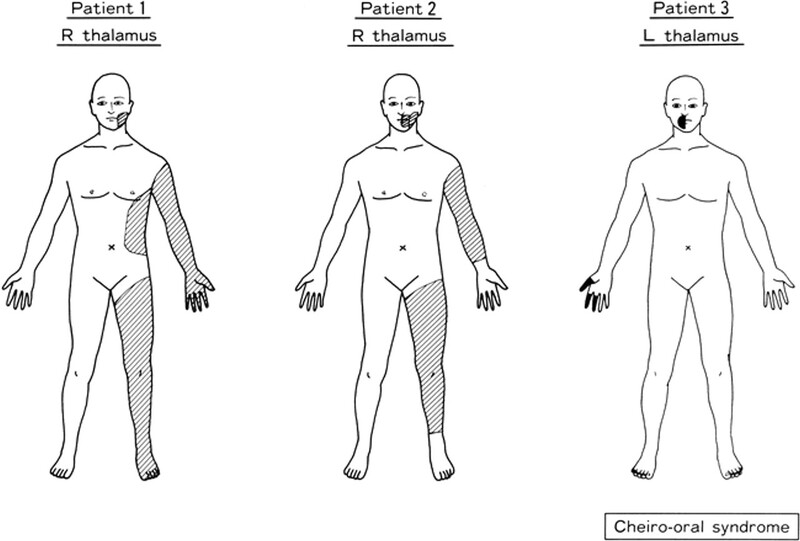 Diagram of the distribution of somatosensory deficits in three patients with thalamic lesions (patients 1−3). Panel numbers correspond to patient numbers in the text. MR images show thalamic and pontine hemorrhages (arrowheads) causing pure sensory stroke (panels 1−5, corresponding to patient numbers in the text); in five patients, schematic distributions of these lesions are presented. Patient 2 was a 64-year-old woman with a history of hypertension and hyperlipidemia who suddenly developed numbness of the left extremities. A neurologic examination showed normal motor function with normal deep tendon reflexes. Babinski's sign was absent. Pinprick, temperature, vibration, and position sensations were slightly reduced in the left limbs, and severe dysesthesia was present over the left corner of the mouth, cheek, elbow, and leg (Fig 1). T2-weighted MR imaging performed 1 month after onset of symptoms revealed a lesion in the ventral posterior lateral (VPL) nucleus of the right thalamus (Fig 2). Objective sensory deficits gradually improved, but refractory dysesthesia persisted over the left side of the body, especially the left side of the face and the left elbow, despite trials of many medications, including carbamazepine, amitriptyline, and maprotiline. Patient 3 was a 46-year-old man with a history of hypertension who suddenly developed numbness at the right corner of the mouth and right first to third fingers (cheiro-oral syndrome), with no other symptoms in the arm, leg, or trunk. A neurologic examination revealed marked dysesthesia at the right corner of the mouth and in the fingers of the right hand (Fig 1). In the fingers, and especially in the thumb, this sensation had a burning quality. Perception of pinprick, temperature, vibration, and position was normal. Motor paresis was absent. Reflexes were normal, and Babinski's sign was absent. T1-weighted MR imaging performed 2 weeks after the onset of symptoms showed a lesion of high signal intensity at the border between the left VPL and VPM nuclei (Fig 2). Twelve months later, numbness of the corner of the mouth had gradually disappeared, but dysesthesias in the fingers remained. Patient 4 was a 59-year-old man with a history of hypertension and diabetes mellitus who suddenly developed numbness at both corners of his mouth and lip and in four fingers and all toes on the right side (cheiro-oral-crural syndrome). No symptoms were noted in the tongue or elsewhere over the arm, leg, and trunk. A neurologic examination revealed marked dysesthesia and slight impairment of vibration and position sense in both corners of the mouth and in the fingers and toes on the right side (Fig 3). In the involved fingers, especially the thumb, this sensation had a burning quality. Perception of pinprick, touch, and temperature was normal. Motor paresis was absent. Reflexes were normal, and Babinski's sign was absent. 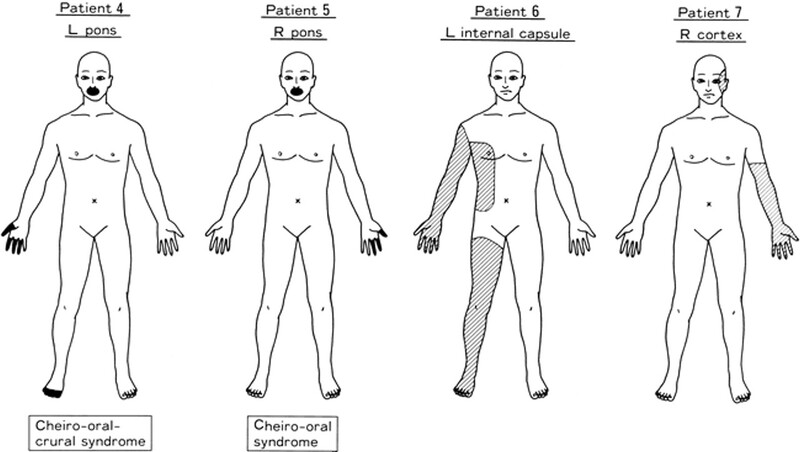 Diagram of the distribution of somatosensory deficits in four patients with lesions of the pons (patients 4 and 5), internal capsule (patient 6), and cerebral cortex (patient 7). Panel numbers correspond to patient numbers in the text. T1-weighted MR imaging performed 10 days after the onset of symptoms showed a lesion of high signal intensity in the left medial lemniscus of the pons (Fig 2). The lesion was thought to include the ipsilateral ventral trigeminothalamic tract. Three months later, numbness at the corners of the mouth and in the toes had gradually disappeared, but dysesthesias in the fingers remained. Patient 5 was a 57-year-old woman with a history of hypertension who suddenly developed numbness at both corners of her mouth and lip and in the first three fingers on the left side (cheiro-oral syndrome), with no other symptoms in arm, leg, or trunk. A neurologic examination revealed marked dysesthesia in both corners of the mouth and in the left first to third fingers (Fig 3). Perception of pinprick, temperature, vibration, and joint position was normal. Motor paresis was absent. T1-weighted MR imaging performed 8 days after onset of symptoms showed two lesions of high signal intensity in the right medial lemniscus and ventral trigeminothalamic tract of the pons (Fig 2). Patient 6 was a 56-year-old man with a history of hypertension and hyperlipidemia who developed numbness over the right half of his body. A neurologic examination revealed dysesthesia in the right arm, right leg, and right side of the trunk. A decrease in pinprick, temperature, vibration, and position sensations was noted in the right limbs and right side of the trunk (Fig 3). Motor function was normal. Deep tendon reflexes were decreased bilaterally. T1-weighted MR imaging performed 5 days after the onset of symptoms showed a lesion of high signal intensity in the posterior part of the posterior limb of the left internal capsule (Fig 4). 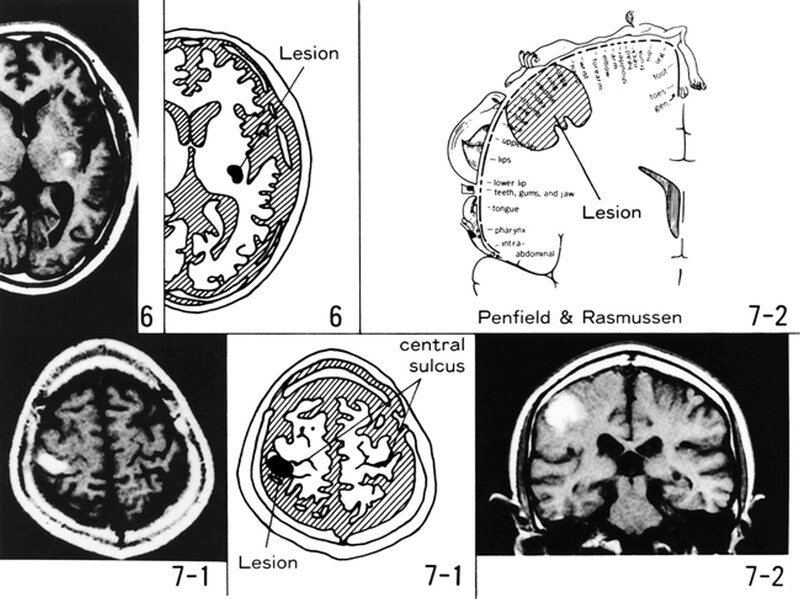 MR images show capsular and cortical lesions (panels 6 and 7); schematic distributions of the lesions are presented. Coronal T1-weighted MR image of patient 7 (panel 7–2) and schematic somatotopic sensory distributions on the postcentral gyrus (according to Penfield and Rasmussen) show the hemorrhage involving the face and hand areas. Patient 7 was a 62-year-old right-handed man with no history of systemic hypertension who suddenly developed numbness in his left hand. He could move his fingers normally but dropped small objects held in that hand. A neurologic examination revealed motor function to be good and deep tendon reflexes to be normal and equal with flexor plantar responses. Pinprick, light touch, temperature, and vibration sensations were slightly decreased in the left hand, and slight dysesthesia was present over the left arm and the side of the face near the left ear. Stereognosis, graphesthesia, and two-point discrimination in the left palm were moderately impaired (Fig 3). Visual fields were full to confrontation. No left hemispatial neglect was evident. T1-weighted MR imaging performed 1 month after onset revealed a high intensity lesion in the right postcentral gyrus (Fig 4). MR imaging was performed 12 days after the onset of symptoms in patient 1, 1 month after the onset of symptoms in patient 2, 2 weeks after the onset of symptoms in patient 3, 10 days after the onset of symptoms in patient 4, 8 days after the onset of symptoms in patient 5, 5 days after the onset of symptoms in patient 6, and 1 month after the onset of symptoms in patient 7. In some cases, this was weeks after the presenting clinical events. At admission (day 1), however, all patients underwent CT and showed focal hemorrhages corresponding to the MR lesions. The hemorrhages seen on delayed MR images were not delayed hemorrhagic transformations of what were initially ischemic infarctions. Fisher (10) reported that objective sensory disturbances are mild in cases of PSS, with careful neurologic examination revealing only faintly decreased sensation. The seven patients considered herein showed primarily subjective sensory complaints, such as dysesthesia and paresthesia, and varying objective sensory disturbances involving pinprick, temperature, vibration, and position sensations. In these patients with PSS, dysesthesias owing to pontine and thalamic lesions were more severe and refractory than those caused by lesions at other sites. In patient 2, a 64-year-old woman with PSS caused by thalamic hemorrhage, objective sensory deficits gradually improved, but refractory dysesthesia, severe enough to cause sleep disturbance, remained for 6 years over the left half of the body (especially the left side of the face and left elbow) despite treatment with a variety of drugs. A second characteristic of sensory deficit in PSS owing to a pontine lesion is a discrepancy between superficial and deep sensory disturbances. In patients with PSS caused by a pontine lesion, the lesions involved the medial lemniscus with the ventral trigeminothalamic tract, sparing the anterior spinothalamic tract and lateral spinothalamic tract (Fig 2). In pontine PSS, perception of vibration and position (medial lemniscal modalities) was reduced on the paresthetic side but pinprick and temperature (spinothalamic modalities) were perceived normally. In contrast, non-pontine PSS (thalamic, internal capsular, and cortical lesions) showed mild sensory deficits of both spinothalamic and medial lemniscal modalities. In thalamic PSS, all lesions involved the ventral posterior lateral (VPL) nucleus or the ventral posterior medial (VPM) nucleus (Fig 2). The ascending fibers from lower and upper limbs and trunk terminate in the VPL nucleus, and trigeminal fibers from the face terminate in the VPM nucleus. 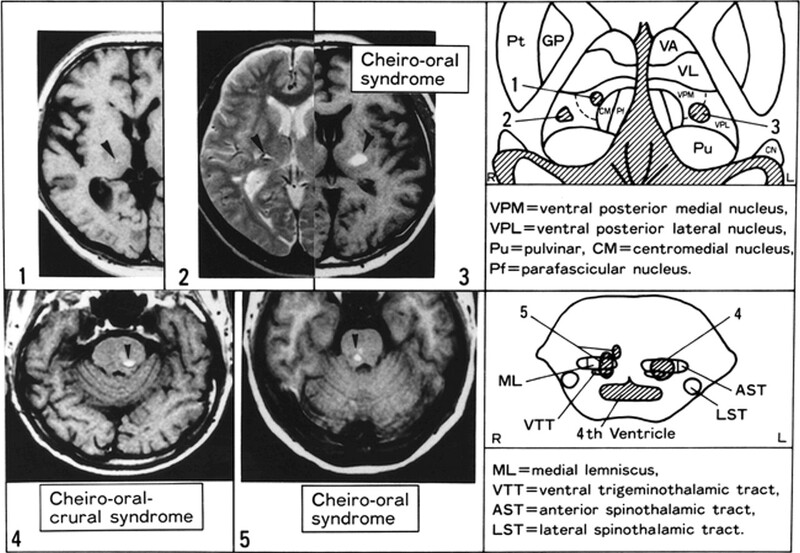 Accordingly, the lesion of thalamic cheiro-oral syndrome was situated in the border zone between VPL and VPM nuclei (Fig 2, upper right panel). Cheiro-oral syndromes, sometimes including a crural component, also were present in pontine PSS (patients 4 and 5). The lesion responsible for brain stem cheiro-oral syndromes is thought to involve the medial lemniscus, which is somatotopically organized with respect to the upper and lower limbs (11, 12). This pattern extends from the medial to lateral paramedian pontine tegmentum; ascending fibers from the lower limb are located laterally, whereas those from the upper limb are located medially. The ventral trigeminothalamic tract, which transmits epicritic sensation from the face, is medially situated and is dorsal to these fibers (12). Lesions including both the medial lemniscus and ventral trigeminothalamic tract in the pons may produce pontine cheiro-oral(-crural) syndrome. In patients 4 and 5, who displayed pontine cheiro-oral-crural syndrome, the dysesthesia involved both corners of the mouth and lip. The clinicoanatomic basis for bilateral involvement about the mouth is unknown. Matsumoto et al (13) suggested two possibilities: one, that the hematoma in the acute stage may transiently impair the medial portion of the contralateral medial lemniscus, where secondary sensory fibers from the mouth lie nearest to the other side; and the other, that uncrossed fibers of the dorsal trigeminothalamic tract and the medial portion of the medial lemniscus may be involved ipsilaterally in the brain stem. In any case, bilateral oral involvement is characteristic of pontine cheiro-oral(-crural) syndrome. Reports of PSS caused by a cortical lesion have been very rare (8, 9), especially those describing cheiro-oral syndromes (14, 15). The characteristics of sensory deficits in PSS caused by a cortical lesion include abnormal stereognosis and graphesthesia. The posture of limbs on the paresthetic side may be abnormal, and our patient showed clumsiness of the hand. Finally, Kim (9) described seven patients with PSS caused by lenticulocapsular or corona radiata strokes. In that report, symptoms probably were due to involvement of the thalamocortical projection in the internal capsule and corona radiata. As we have shown, the precise location of a hemorrhage causing PSS leaves a fairly distinctive imprint on the clinical picture that reflects regional anatomic peculiarities. MR imaging has contributed much to understanding of these relationships better. ↵1 Address reprint requests to Shuzo Shintani, MD, Department of Neurology, Toride Kyodo General Hospital, 2–1–1 Hongoh, Toride City, Ibaraki 302–0022, Japan.